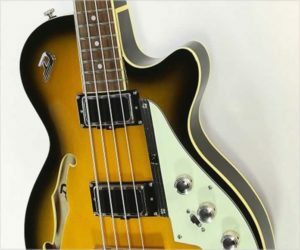 The Duesenberg Starplayer Bass takes inspiration from classic German basses of the 1950’s and 1960’s, but with significant improvements. The Starplayer Bass uses single cutaway hollow body with laminated Spruce top on a laminated Flame Maple back and bent Maple sides. The Maple neck is short scale – 30.3 inch or 770mm – and has a bound Rosewood fingerboard, plus a dual-action truss rod. 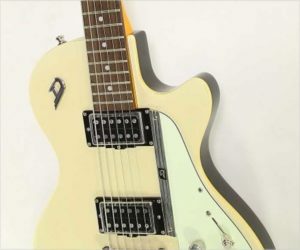 Introduced in 2002, the Duesenberg Starplayer Special uses the classic bolt-on design, with a full 25.5 inch scale maple neck on and alder body with humbucking pickups. The neck sports an Indian Rosewood fingerboard, with Mother of Pearl dot inlays. It is a straightforward guitar, delivering exactly what it advertises. This early Duesenberg Starplayer Special, built during 2002 – the first year of production – is in very clean, all original condition. It plays very well and has just the slightest wear, even to the frets. The original Duesenberg hard shell case is included. 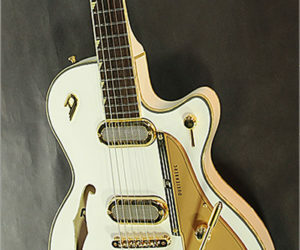 The Duesenberg Starplayer TV Phonic Thinline Archtop Electric is a semi hollow, dual pickup, 22 fret electric thinline guitar, featuring arched top and flat back, bent sides, gold plated hardware and a 648mm (25.5 inch) scale. With the Starplayer TV Phonic in an all-over bright Venetian White we are continuing our vision of truly independent hardware design. As the first model in our Starplayer TV line it features our new spectacular ‘Phonico’ pickup covers and the 4-way rotary pickup selector placed at the cutaway.